Wales coach Warren Gatland has warned Welsh rugby can "ill afford" to lose a player of national skipper Sam Warburton's stature. 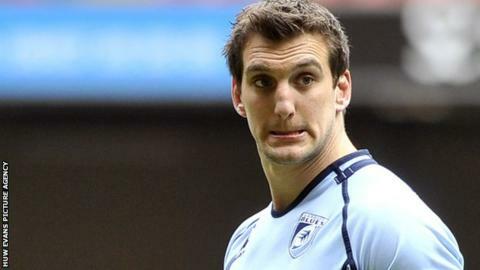 Warburton, also the British and Irish Lions captain, has given Cardiff Blues and the Welsh Rugby Union a Wednesday deadline to put together a deal to keep him in the country. Gatland said economic reality dictated the player could leave. But he added: "We can ill afford to lose someone of that sort of calibre." The financial uncertainly has led to Warburton joining a host of players considering their playing futures beyond the end of the 2013-14 campaign. A number of Wales internationals are already at leading French and English clubs and Warburton is among those who could join them. Gatland said: "For me it would be such a shame to lose someone of Sam's stature - he is the Wales captain, he is the current Lions captain and I think we can ill afford, from a union's point of view and from a regional point of view, to lose someone of that sort of calibre." However, the New Zealander acknowledges players such as Warburton find themselves in a situation common in football, citing the example of Wales star from Tottenham Hotspur. "And if we can't match the huge offers that are being given to them overseas then sometimes you can't begrudge players those chances. "They're only in his game for a short time in terms of a professional career and it's about looking after themselves and potentially their future and their families. "We wouldn't be asking Gareth Bale to turn down that sort of money to play in Wales, if that's what it meant. "So let's just make sure that we're practical about it and sensible." If Warburton leaves the Blues, he could join fellow Wales and Lions stars Richard Hibbard, Alun Wyn Jones, Adam Jones and regional team-mate Leigh Halfpenny in departing the domestic scene. Wing George North joined Northampton before the current campaign while Lions lock Ian Evans has already committed his future to French club Toulon. And Clermont Auvergne have signed Scarlets, Wales and Lions centre Jonathan Davies from 2014-15. Luke Charteris, Dan Lydiate, Jamie Roberts, Mike Phillips and James Hook already play for clubs in France while George North, Paul James and Craig Mitchell are in England. Gatland repeated his desire for anyone leaving Wales to ensure they have full release for all Wales playing and training duties. Meanwhile, ex-Wales number eight Stuart Davies hopes Warburton can be persuaded to stay in Wales. "With the competition that's out there from abroad it's not a battle that the Blues can win on their own," Davies said. "With the context of the cap that's in place and the salary someone of Warburton's stature can command in the game these days you have to sympathise with the region that they can't cover it alone," Davies told BBC Radio Wales Sport. "They probably can't put a package together that can keep Warburton in the place that he wants to stay by all accounts." WRU chief executive Roger Lewis has previously said the union is committed to the supporting the regions. "We sincerely hope that our professional regional organisations are able to retain their best players in Wales," Lewis said. The WRU has offered to help the four regions keep their leading Welsh players in Wales. The WRU said it would employ all of the regions' leading Wales players whose deals expire in 2014.